Folk tales are considered a vital part of a region’s cultural heritage and tradition. North America is breaming with such stories: John Henry and his role as a hard working steel driver on nineteenth century train tracks, the Native American story of how the Earth was built atop a turtle’s back, and the one with the most statue-esk representation known as the axe welding Paul Bunyan. Comic book wise, Folk tale/folklore related material usually puts the image of the Fables series into mind. 2002’s Ancient Joe plots its own points when it comes to Cuban folk tales, grabbing my interest and making it my next review. 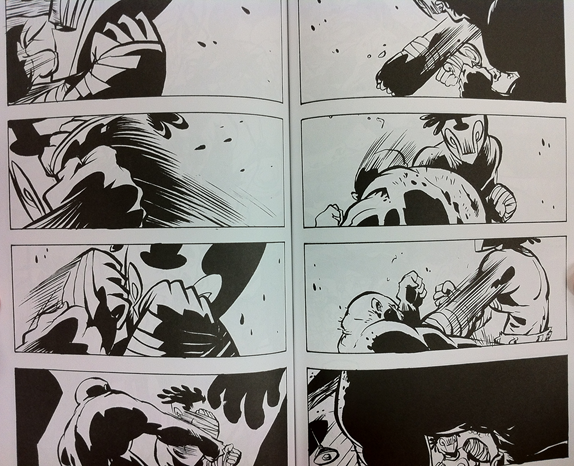 Ancient Joe was created by C. Scott Morse, known for titles like Spaghetti Western put out by Oni Press, The Barefoot Serpent released from Top Shelf, as well as the hard to find work Soulwind that got him nominated for an Eisner and Ignatz award. He is also credited under various roles for Pixar’s films and shorts as a storyboard and background artist. Legend tells of a man named Ancient Joe who for centuries had been incapable of escaping from the Caribbean Islands (think the island of Cuba) for whenever he got on a boat, destruction befalls it and he is left at sea only to wait for fisherman to pull him up. He made friends with the area’s people by drinking and boxing with them. One day he decides to get married, from there he lives with her until she dies of old age years later where Joe still appears to not aged a day. Time moves ever forward to Ancient Joe’s setting of 1998 Cuba where Joe searches for a way to find the exact location of his wife’s soul. Joe feels that his past with El Diablo might have her in his own personal hell. During a friendly drive in the back of a friend’s pickup truck (Joe usually walks everywhere); one of the two children sitting with him asked Joe if he was the Chupacabra. Joe played this off as a joke until the other child called Joe El Bizarron and thus asking for the Devil’s gold he took. Thus we the readers are privy to a retelling of the El Bizarron story; entailing one man’s ability to convince his new employer El Diablo that he welded super-human powers. See, El Bizarron wanted to find work, so he heard that El Diablo was hiring. El Diablo tasked him with jobs that El Bizarron cleverly worked around; convincing him that he had the strength of many men. This soon led to uneasiness which lead to outright fear, leading to El Diablo sending El Bizarron far away by offering bags of gold and a burro (donkey). Thus gives us Joe’s understandable fear of his wife’s final resting place in relation to his past with El Diablo. You might have noticed that I have yet to describe what Ancient Joe actually looks like. Joe is a dark-skinned middle sized man with pupil-less eyes and a face hidden by a skull looking face mask that looks like an upside down “W”; black clumpy hair shoots out from the top of his head. He looks like he is perpetually ready to box with his heavily bandaged arms and legs, with a spiral set into his torso. I do believe that the look of Ancient Joe makes him iconic. I cannot say that I care for C. Scott Morse’s other character designs, with their beady soulless eyes. Every human has this unnatural way of looking like they were just possessed by a malicious spirit or are dead inside. To be fair, El Diablo’s appearance of a stone idol is pretty cool. 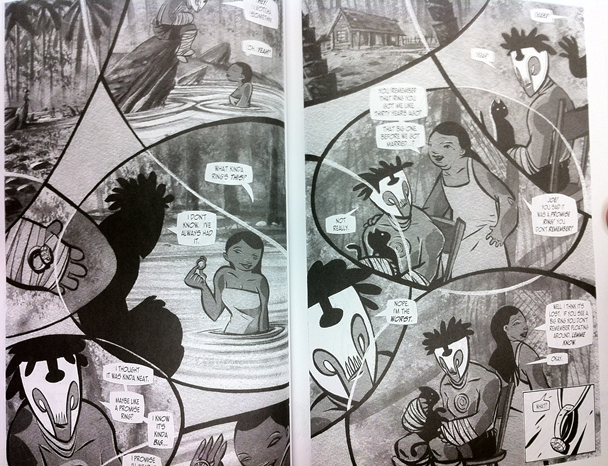 Pros: I enjoyed the change of pace for a comic written around Central American folk tales and settings. I personally think that Dark Horse needs to put out a statue of Joe like how they release statues of Disney characters and of Bettie Page. Transmetropolitan’s Spider Jerusalem gets one, why cannot the same go for Joe? Features a bitter sweet ending that plays off of what it means to lose a loved one (which I promise is nowhere near as sentimental as that statement would have you believe). Cover features vibrant colors of teal and rusted red. Cons: Human character designs did distract my attention more often than I would have liked. Falls on the shorter end of comics where every comic seems to either go on forever raking up shelves of volumes like Fables mentioned earlier, or has only enough issues to require two hands to count and not warrant page numbers. Hard to describe this, but the “Hey, ese” and “Hey, man” dialog between the people Joe talks to gets old rather quickly. To be fair I might have had a problem with it even if it was not there. Ancient Joe was originally released as three issues under something called Loud Cannoli, but later collected under a past written be the Dark Horse Imprint called Maverick. Bottom-line, Ancient Joe is a quick read that I burned through while waiting twenty-something minutes for my shuttles bus to arrive. I am fighting the urge right now to reread it in its entirety as I write this, but you will discover that it really only wants a little of your time, not a big time consumer. 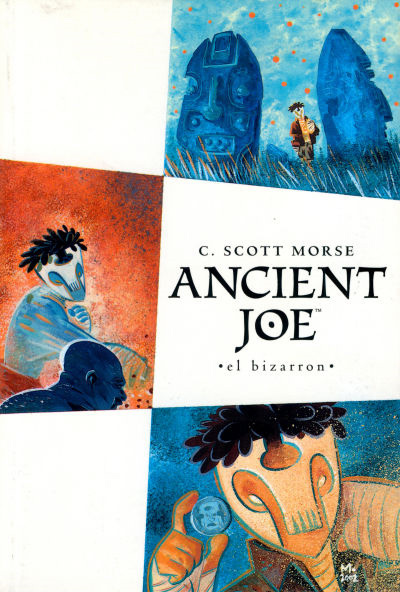 I personally believe that C. Scott Morse should combine his comic and his animator nature and set up an Ancient Joe short film incorporating the colors I have seen on both Ancient Joe’s cover and what I have seen on C. Scott Morse’s site. Or at the least rerelease a digital copy with Morse recoloring everything like how Jeff Smith’s comic Bone was rereleased in full color editions; thus making the C. Scott Morse equivalent of a Ben Templesmith comic. Bottom line, find it, buy it, rush through it, share it, and then restart. The Spider Jerusalem figure image provided by CTBF’s friend Troy Rogers.